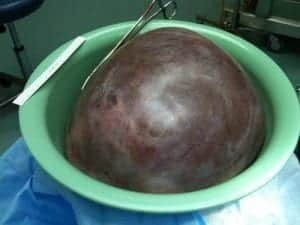 This image shows a 50 pound (22.7kg) cyst, removed from a woman’s abdomen. What’s even more confronting is knowing the woman’s doctors ignored her pain and discomfort for months. It’s a narrative we hear too often: a woman goes to the doctor in pain, her symptoms are brushed off, and she’s dismissed as being dramatic, needing to lose weight, or feeling anxiety. Kayla Rahn, 30, from Montgomery, Alabama, had experienced abdominal pain and unexplained weight gain for months. When she eventually sought help from a physician, she was simply told to lose weight. “I couldn’t even walk to my car without losing my breath”, Rahn said. Finally, she found help at Jackson Hospital emergency room. Her extreme pain had led to her mother taking her to Jackson Hospital where, quite literally, a huge weight was lifted from her, when Dr. Gregory Jones removed the massive ovarian cyst. She’s expected to make a full recovery. How Can A 50 Pound Cyst Go Unnoticed? Gynaecological conditions can easily be brushed aside by professionals as ‘normal’ pain associated with periods or ovulation. Quick weight gain can be easily explained away as a result of poor eating habits or lifestyle choices, despite a woman saying otherwise. Top gynaecological specialists, however, have evidence and personal experiences to show gynaecological pain isn’t normal. “As a specialist in this field of reproductive medicine and women’s health, I can tell you that you aren’t meant to get pain. Sure, some slight bloating and a bit of pressure … but not pain. Many women are conditioned to accept the urban myth that period pain is normal, when it isn’t. “Worse yet, severe pain can be due to cervical or ovarian cancer. Many women die each year from cancers that could be prevented or treated through early intervention. But, sadly, too many women leave it too late, thinking that pain is normal. “This is by no means meant to cause panic or sensationalism. It is a very serious issue that I see every day in my practice. I just want to help women relieve this unnecessary pain – or stop believing that pain is normal for them”. Even if a woman presents with abdominal pain and is given a brief ultrasound, a cyst can still go unnoticed – especially by an untrained eye. That’s why Dr. Orr encourages women with cyclical, ovarian or other possible gynaecological problems to see a specialist straight away. “You have to be your own advocate for your medical care. If something’s wrong, keep bringing it up with your physician”. He also said this case was a prime example of why a woman shouldn’t be afraid to seek a second opinion. Are Women Routinely Brushed Off By Medical Professionals? It would be an unfair generalisation to say all healthcare professionals routinely brush off women’s pain and other medical concerns. However, statistics show, compared with men, women are frequently taken less seriously when seeking medical care for pain. A study published in the New England Journal of Medicine in 2000 found women were seven times more likely than men to be misdiagnosed and sent home during a heart attack. This is a two-fold issue. First, women in pain aren’t taken seriously. Second, most research and professional education about cardiac symptoms focus on male symptoms and presentations. Even if a woman’s pain is taken seriously, her provider might not have enough knowledge about her condition to diagnose and treat her properly. Another study found women wait an average of 65 minutes before receiving pain medication in the emergency department; in comparison, men wait an average of 45 minutes. A situation where a woman’s symptoms are ignored long enough for a 50 pound cyst to grow seems an extreme example. Although few cysts grow quite that large, Dr. Orr has experienced similar cases. One woman sought help from five doctors, and even had some diagnostic exams, but was simply encouraged to lose weight, and treat her reflux. 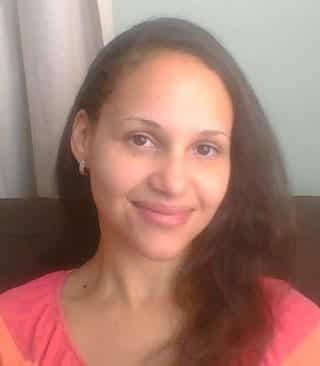 By the time she sought help from Dr. Orr and his surgical team, she had an 11 pound (5kg) ovarian cyst. You can read more about Dr. Orr’s experience with an 11 pound tumour, and why pain shouldn’t be ignored in Ovulation Pain – 5 Reasons Not To Ignore Painful Ovulation. You might assume these situations would occur only if a woman lacked knowledge about healthcare or self-advocacy, or if the woman were very young. Not true. A midwife and nurse practitioner student from Pennsylvania nearly lost her life because her pain was not taken seriously. Midwife Erin Kershaw experienced such severe abdominal pain during what she thought was a typical miscarriage she was forced to call for an ambulance. During the next several hours her pain was excused away and only treated with pain medication, which took the edge off for very brief periods of time. “Got to the hospital at 11 and no matter how many times I begged for them to help me breathe, all they did was give me morphine or dilaudid to help take the edge off. It worked for maybe 20 minutes and then the pain was so bad that I couldn’t breathe again. “I also had a lot of abdominal swelling. They kept talking about doing an ultrasound and CT scan, but it took over FOUR HOURS just for them to decide what they would do”. She was finally given treatment, and it was discovered her uterus had ruptured from a rare ectopic pregnancy that had implanted in her uterine muscle. This was only discovered several hours after her arrival, and by that point she had lost nearly 50% of her blood volume, due to internal bleeding. She required a hysterectomy and several blood transfusions. An educated midwife nearly lost her life, simply because her pain wasn’t taken seriously enough. We have no intention of scaring women; neither do we assume all healthcare providers provide inadequate treatment for women. However, it is vital we all recognise the disparities in healthcare so we can work towards change and be aware of self-advocacy until we see that change implemented.